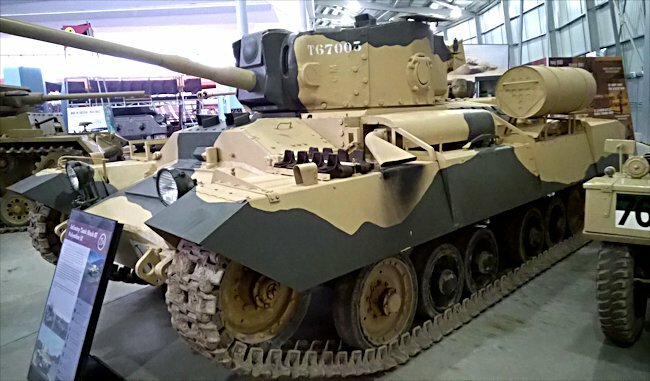 This Surviving WW2 British Valentine IX Tank can be found at the Tank Museum, Bovington, Dorset, England. 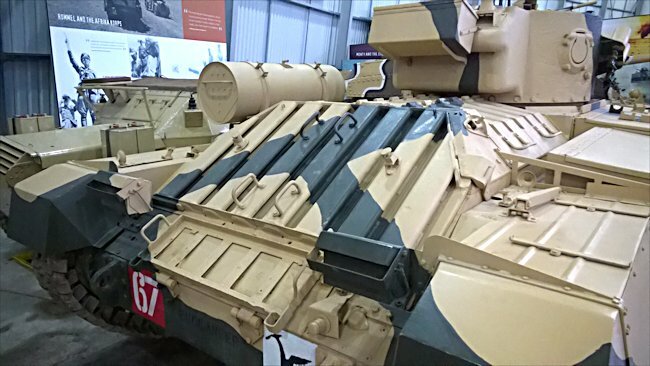 This version of the Valentine tank was still classified as an infantry tank: a slow moving heavily armoured vehicle designed to give support to advancing regiments of foot soldiers. It was not as heavily armoured as the Matilda II infantry tank or the Churchill tank, but what it lacked in armour it made up for in mechanical reliability. It saw action in the North African desert campaigns, the Russian battlefields and in the Pacific with New Zealand troops. The designers managed to improve the fire power of the Valentine tank twice in its life time. It originally entered service in 1940 with a 2 pounder (40 mm) gun. At that time it was a powerful weapon that could knock out most Italian and early German tanks. As soon as the enemy vehicles improved their armour thickness to counter the threat from the 2pdr gun, British engineers managed to fit a 6 pounder (57 mm) gun to a modified Valentine turret. The Valentine Tank needed a more powerful weapon to try and stop the mighty German Tiger tank that appeared on the battlefield. The result was the Valentine IX tank. 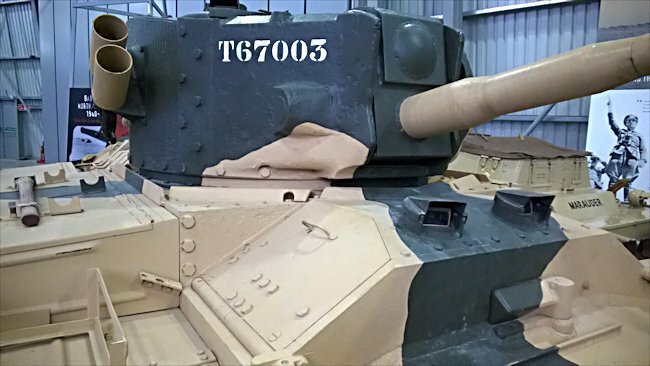 A new turret was built to take the Royal Ordnance QF 75mm tank gun. The letters QF stand for 'quick firing'. The new gun was produced by boring out existing supplies of 6 pounder guns to take the American 75 mm shell. The breech of the gun had to be adapted to enable the new round to be loaded and fired. The high explosive HE shell was effective but the Armour Piercing AP round was not up to the job of penetrating new German tank's thick and sloping armour and long distances. The Valentine had a few advantages over some of the other types of tanks being used by the Allies. Its low profile made it a hard target to hit, especially when it was in a hull down position. The tank crew would dig a large depression and drive their tank into it so only the turret was visible to the enemy. It could also take better advantage of any small folds in the landscape. Because of its low height it was much easier to stay out of sight from the enemy. By the time the Valentine IX tank arrived on the battlefield there were better British and American tanks becoming available in sufficient numbers. 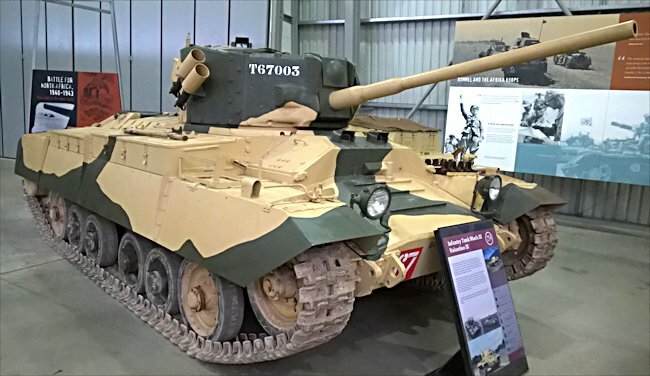 The Churchill, Cromwell and Sherman tank had almost replaced all front-line units that had been using Valentine Tanks by 1944. The Red Army continued to use their lend lease Valentine IX tanks until the end of the war. They were all produced in Canada and shipped over to the Soviets. The Russians used them mainly in the second line of battle to support the bigger Russian produced tanks like the KV-1 and T34/85.